Act as a liaison between CSSP and Colorado training programs in order to strengthen collaborative efforts with regard to professional standards and development opportunities for school psychologists. Identify and discuss research and training needs that could be fulfilled in collaboration with CSSP. Create and maintain a list (with contact information including email addresses) of all trainers in their school psychology training programs. Address issues raised by members via the website and forwarded by the Technology chair as appropriate. Responsible for defining ethical standards and for responding promptly and completely to all ethical informal inquiries. Collaborate with Independent Practice, Legislative, and CDE representatives on ethical issues as they arise. Consult with NASP Delegate and NASP Ethics chairperson as needed. In the event that an ethical complaint is received, a referral to the appropriate licensure body will be made (e.g. CDE, DORA). Volunteer to assist with activities at the annual conference as stipulated through contact with the Conference chairperson. 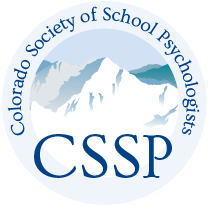 Communicate with the CSSP Council and members regarding issues at the state department that would be of interest and concern to the CSSP leadership to promote a proactive approach to school psychology in the state of Colorado. Write an article for each CSSP newsletter. Discuss ethical issues related to the practice of school psychology and state legal mandates with the CSSP Ethics committee. Discuss current state and federal legal issues as well as proposed changes with the Legislative Committee Chair. Serve on CSSP ad hoc committees as appointed by the President. Communicate with the CSSP Executive Council and members regarding issues from school psychologists who work concurrently in schools and private practice. Create a written document (position paper) defining potential ethical issues and recommended standards for people employed in schools and in independent practice. Get approval of the position paper from the Executive Council and forward the position paper to the Publications Chairperson for inclusion in newsletter. Monitor any legislation impacting independent practice and consult with the legislative committee. Create a list of individuals involved in independent practice as school psychologists with current contact information including email addresses (refer to requested additions to membership form). Coordinate with the Ethics chairperson regarding ethical issues that impact independent practice. Address issues identified by members via the website and forwarded by the technology chair as appropriate.